The Marine Theatre01297 442394work TheatreBuilt in 1894, the Marine Theatre is a local venue with a national reputation. Over it's rich history spanning 121 years, the theatre has played many starring roles; as the town’s public sea baths, a theatre, sometime-cinema, and drill hall. It's now an artistic hub where local residents and visitors are united and inspired by a varied programme of excellent art. From national celebrity figures to prestigious touring companies offering theatre, children's shows, music and dance, it's a unique venue with incredible views over the Jurassic Coast from the Stage Door Bar. 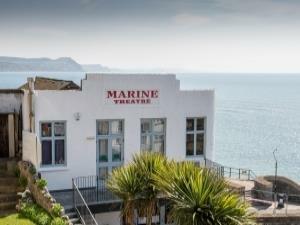 Built in 1894, the Marine Theatre is a local venue with a national reputation. Over it's rich history spanning 121 years, the theatre has played many starring roles; as the town’s public sea baths, a theatre, sometime-cinema, and drill hall. It's now an artistic hub where local residents and visitors are united and inspired by a varied programme of excellent art. From national celebrity figures to prestigious touring companies offering theatre, children's shows, music and dance, it's a unique venue with incredible views over the Jurassic Coast from the Stage Door Bar.